Talking about the strongest devil fruits has always been a hot-headed argument between fellow One Piece fans. And how could it not? There is no scale in the series which we could use to describe strong devil fruits. However, we can guess about our experience and personal opinions. Therefore, this list is based on my personal opinions on the strongest devil fruits. And it most likely will not be accepted by 90% of the One Piece community as you know, everyone has their own opinion. And it’s quite hard to tell which devil fruits are the strongest when we all know that in reality, it all depends on the user and how the user uses its fruit. Even the weakest devil fruits can become strong when you let your imagination go. Personally, if I could pick fruit for myself, I think I would choose Bartolomeo’s barrier fruit. I think there are so many unexplored possibilities with that fruit. And Bartolomeo has been using them in quite a simple mannered way. However, it is not a fruit that I would add to this list. If you like this article after reading it you can follow me on Instagram for daily anime content. Last week I have talked about how all One Piece theories are wrong. Warning: If you have not caught up with the latest episodes of One Piece this post may contain spoilers. Hobi Hobi no Mi is the fruit that Sugar uses during Dressrosa arc and it grants her the ability to change everyone she touches into toys. The user itself is weak but I think this fruit is one of the strongest devil fruits there is. Weakness: You actually have to touch the person. 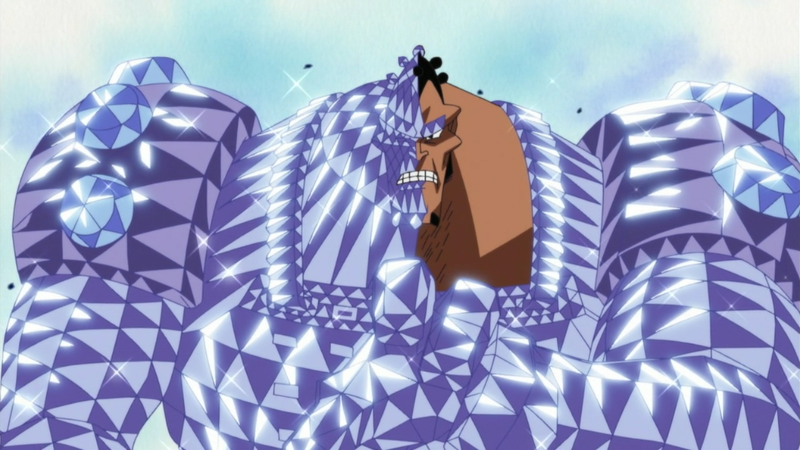 Mero Mero no Mi is used by Boa Hancock during the Marineford arc in One Piece. She can use her devil fruit to turn everyone who likes her into stone. Weakness: If the person is not charmed by Boa Hancocks looks then the power is useless on them. Suna Suna no Mi is a Logia type (and we all know Logia are among the strongest devil fruits) used by Crocodile during the Alabasta arc. Crocodile had dealt a lot of damage to Luffy (while almost killing him), we can see him controlling large amounts of sand and drying people to death. Weakness: Simple water tricks can defeat it. Kage Kage no Mi is used by Gekko Moriah during the Thriller Bark arc. It grants him the ability to steal shadows, manipulate them to his own will, put shadows into dead bodies and give them life. He can then control those who he had given shadows too. And we also know that Moriah grows stronger by consuming shadows. Weakness: The shadows can be used against him by stealing, capturing and consuming them. Thriller Bark was quite a horror-ish arc to watch, it gave me a bit of spook at some moments. Speaking of which, if you like horror, then you should definitely check out my list of best horror anime. You’ll be sure to find some good recommendations there. Hito Hito no Mi was used by Sengoku during the Marineford arc. And it grants him the ability to turn into a giant golden Buddha. This greatly enhances his attack and defense powers. Weakness: It does not have any apparent weaknesses. Daiya Daiya no Mi first used by Jozu during the Marineford arc is quite similar to Sengoku’s Hito Hito no Mi. However, it turns the user into diamond ( and for me diamond > gold ). This fruit greatly increases the user’s offense and defense. And is with Hito Hito no mi one of the strongest devil fruits for pure combat. 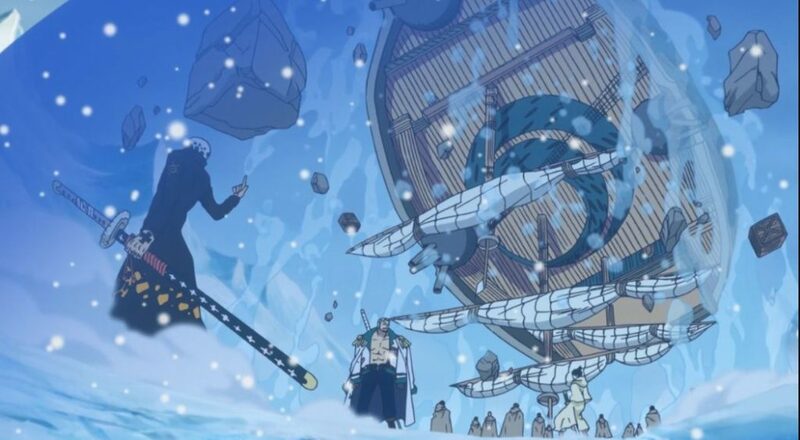 Doku Doku no Mi was used by Magellan during the Impel Down arc. It is quite a fearsome devil fruit as it grants it’s user the ability to produce and control one of the deadliest poisons in One Piece. Ope Ope no Mi devil fruit is first used during Sabaody Archipelago arc by Trafalgar Law. It gives him the ability to create a Room in which he can “Operate”. Law is given the ability to cut his enemies while alive, teleport himself and do many other crazy things. Weakness: It can only be used in the area created by the user and it drains a lot of energy. Soru Soru no Mi is a devil fruit used by Big Mom (Charlotte Linlin) during Wholecake Island arc. It gives her the ability to interact with and manipulate souls at her own free will. She also used her own soul to create two powerful weapons called Prometheus and Zeus. Weakness: The person getting their soul must fear the user in order for them to be able to steal the soul. Nikyu Nikyu no Mi was first introduced during Thriller bark arc when Bartholomew Kuma made his first appearance in the show. This devil fruit grants it’s user the ability to push anything they touch, and that includes objects, people, attacks, air, gases, and even pain. They are also granted super defensive abilities that make them able to repel anything. Goro Goro no mi is a Logia type devil fruit that grants it’s user the ability to control, create and transform into electricity. Being able to transform yourself into electricity and create huge electric attacks is what makes this one of the strongest devil fruits. Weakness: Although it’s quite a strong fruit, it has only one weakness, and that is that it does not work on rubber (lucky Luffy). Gasu Gasu no Mi is a devil fruit first shown used by Caesar Clown during the Punk Hazard arc. It gives Caeser the ability to manipulate, control and turn into all sorts of gases, luckily for him. Caeser can also take out all of the oxygen in a room making all of his opponents breathless, being able to defeat even stronger opponents than himself. Weakness: Requires really good knowledge about gasses and has a weakness against fire. Juryoku Juryoku no Mi is one of the strongest devil fruits in One Piece as it grants it’s user the ability to manipulate gravity. The user can send gravitational force waves to certain areas or objects to make them change their gravity. Weakness: There is no apparent weakness. Hie Hie no Mi is a logia type devil fruit eaten by Kuzan, it was first introduced after the Sky Island Arc when he almost captured the Straw Hats. Kuzan can create Ice, turn into Ice and manipulate Ice. Just like any logia this is a strong devil fruit to have. Weakness: It’s weak against devil fruits with fire or magma abilities. Mera Mera no Mi is used by Fire Fist Ace , also known as Portgas D. Ace. Ace has all the abilities that logia type devil fruits have and it grants him great combat ability and destruction. Tori Tori no Mi Model Phoenix devil fruit was first shown during the Marineford arc used by Marco. Even though this is a Zoan type, it is a mythical fruit and it gives the ability to turn into a Phoenix. Turning into a Phoenix grants the user extra abilities such as regeneration and ability to produce blue flames. Weakness: No weaknesses were shown so far in the series. Magu Magu no Mi is first shown during Marineford Arc by Admiral Akainu. Akainu can turn into Magma, produce it and manipulate it, however, we were also shown that Akainu can create a meteor shower using his magma fists. Gura Gura no Mi is one of the strongest devil fruits in the field of Paramecia. This fruit grants it’s user the ability to create quakes or tremors. Making it possible for Whitebeard to do very dangerous large scale attacks. Weakness: No weakness was shown in the series. However, we do know that due to the big range of the attacks, Whitebeards allies had to distance themselves from him, otherwise they would have been hurt too. Yami Yami no Mi was eaten by Marshall D. Teach, also known as Blackbeard. It grants him the ability to manipulate darkness. Yami Yami no Mi is a logia type devil fruit, however, it is the only Logia type fruit in which the user can not transform into darkness. It also gives the user ability to nulify Devil Fruit powers by touching the user, making him able to fight Logia type without Haki. Pika Pika no Mi is used by Borsalino and it was first introduced during Sabaody Archipelago arc. I know most people would wonder why I would put this fruit as the strongest. And that is actually really simple, it gives the ability to the user to turn into, manipulate and produce light. And light can well… travel at the speed of light, making Borsalino too overpowered, so his lazy personality and dullness make him much less of a threat then someone else could be with this devil fruit. 1. I love your introduction and the way you went through this. Probs on that, i mostly agree with you! 1) Magellan gets diarreha, because he is actually eating poison soup. 2) I would switch Sengoku’s fruit with Jozu. Diamond is harder then gold, but we are talking about the skin of a mystical creature. I don’t think you can compare that. Also the damage output and the pure body mass make the Hito Hito no Mi stronger in my opinion. 3) I think the Soru Soru no Mi is a bit to high ranked in this list. I think some people(i don’t know if you are one of those) forget that the reason, why the fruit is so strong, is that Big Moms body is just sick. The fruit is not what makes her nearly invulnurable, it is her Body. Best example is Mother Caramel. The fruit is among the top 20, but not that high. Thanks for the opinion, I was having trouble deciding on some so I think I Will change up some things.